This looks fantastic. I know what I'm doing with my extra blueberries next week! You said bourbon and I was here like a shot (no pun intended!). I think this might be my cocktail tonight! Cool drink! My son-in-law drinks Makers Mark - I will forward this to him! I am planning to enjoy this fabulous drink you posted here! This sounds perfect for a hot summer weekend! Excellent way to bring in the weekend. 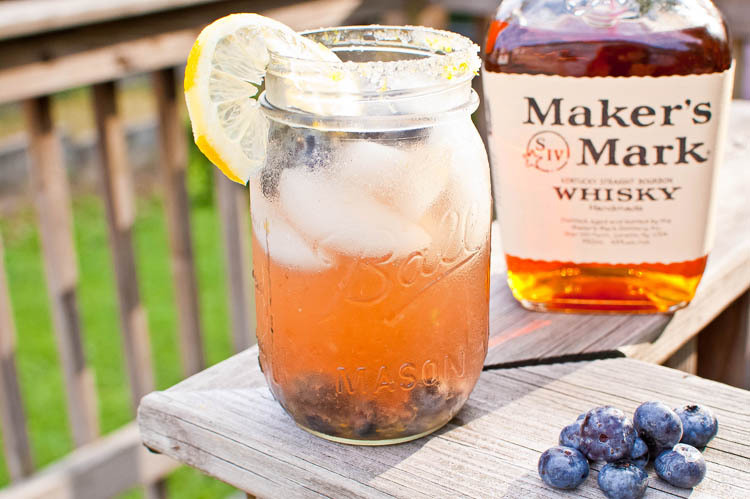 ;) Is it just me or does a drink always taste better in a mason jar? Mmmm....this means I would use my Tigger & Pooh jelly jar as my shot glass. I love the idea of adding maple syrup to a cocktail instead of simple syrup! I bet it's great with bourbon and blueberries. Can't wait to try it! This sounds amazing! I love bourbon, and would love it with fresh berries as a cocktail to kick off the weekend! You had me at bourbon. Great drink! Wow Peggy, you are really tempting me with this drink, really great for the weekend on a Saturday. Love this; it must go down realy smooth. Love blueberries in all my desserts, and pancakes, not have tried it in a cocktail...must be a really good Kentucky Whisky to blend with. The only one I know is Southern Comfort, which I have not made cocktails with in years!!! It looks pretty and sounds delicious! I'm embracing my summer drink on too! Love the photos and the cocktail! that sounds like such a fun cocktail, I love blueberries and we certainly have a lot of them this time of year. Thanks for such a tasty creation! Yum. Perfect for a hot summer day! The blueberries really add something extra too. This drink would be perfect for a post-house cleaning Sunday afternoon! Too bad none of the liquor stores are open in Cayman on Sunday...boo! Teach me not to stock bourbon... Buzzed! Yum!! Great idea for your abundance of blueberries!! Perfect for a warm weekend of indulgence, hehe. Oh my, yes, please...I'll have a double! That drink sounds so good! It sounds nice! Thanks for the post! The addition of fruit is always a plus for cocktails...love how summery and refeshing this must be! How did the meeting with caterer go? I don't drink, but blueberry in alcohol is interesting! Cool drink! looks yummy.. I have to try this. for some reason, I've been really enamored with blueberry-infused drinks lately so these are exactly my kind of thing! Super yum. I am mostly interesting recipes. I love to learn to different recipes. 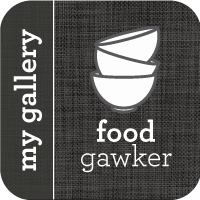 If you have details about new recipes then please share with us. Sounds sweet. 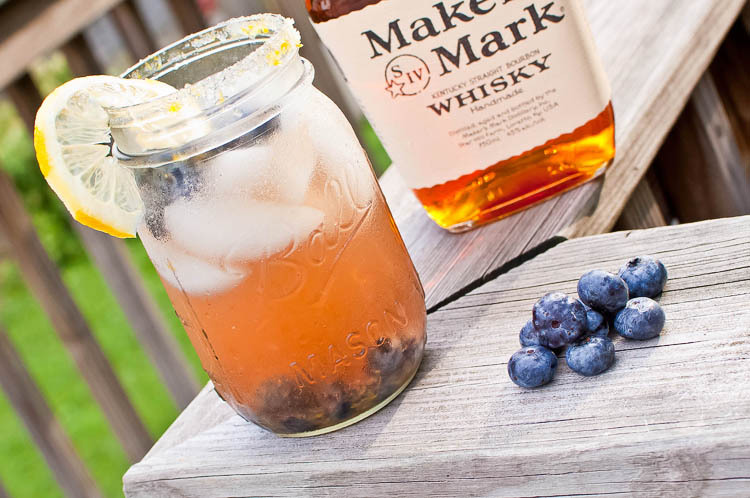 I don't see how the taste of the blueberries--a very mild tasting fruit--can possibly be detected over bourbon and lemon. I love the glass... nothing like partaking of a favored adult beverage from a Mason jar. Definitely gonna mix that up tonight !! Love Makers!! 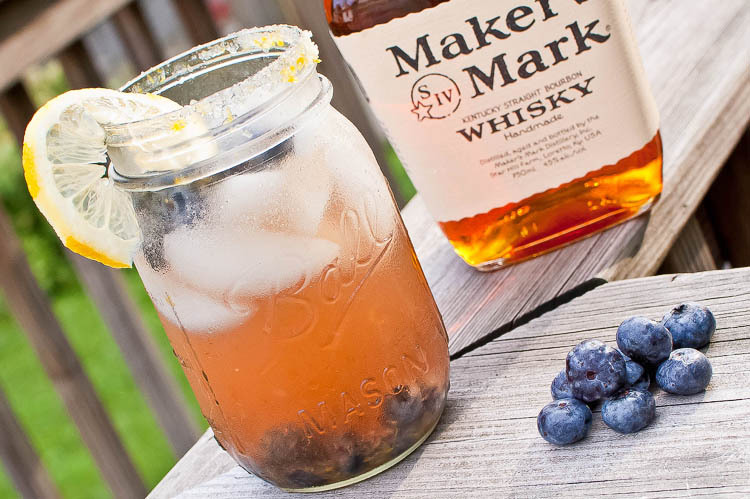 I usually have my bourbon plain, but this I love blueberries and think I may give this a try. I used frozen blueberries because that's what I had handy and this changed the overall taste a little bit. I also used brown sugar instead of regular sugar and this upped the taste considerably.